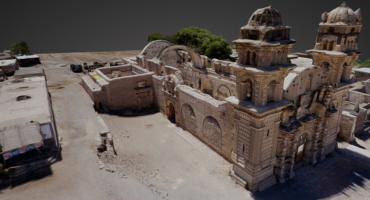 This week we leave Africa and we head to Oman our first destination in Asia, where Bill Isenberger shows us how he is using drones to 3D scan large areas of the medieval site of Al Baleed thanks to photogrammetry. My name is Bill Isenberger, owner of Digital Mapping & Graphics, based in Springfield, Missouri. My emphasis is on detailed site mapping and regional Geographic Information System (GIS) as it relates to archaeology and environment. Over the past decade I have gone from Kite Aerial Photography (KAP) to Pole Aerial Photography (PAP) and now to an Unmanned Aircraft System (UAS) as the main method of acquiring imagery. As the first step when I use photogrammetry for mapping, I set out photo targets and record their locations with a total station or RTK-GPS. 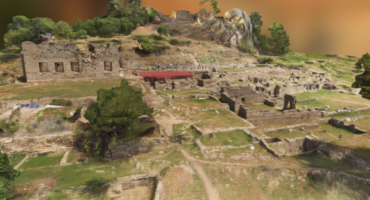 The resulting models and orthophotos are used to obtain real-world measurements and are exported for use in other 3D programs and GIS applications. For many years I have used PhotoModeler and when PhotoModeler Scanner first came out I was a beta tester. 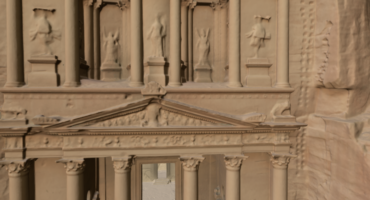 While I still use PhotoModeler and Agisoft Photoscan, recently I have been testing RealityCapture by CapturingReality. Bill Isenberger with his UAV at the site of Al Baleed in Oman. Al Baleed is a UNESCO World Heritage Site in the Sultanate of Oman where I have worked for a number of years, first with Dr. Juris Zarins (Professor Emeritus, Missouri State University) and currently with Dr. Krista Lewis (Associate Professor, University of Arkansas at Little Rock). Al Baleed is a part of the Land of Frankincense and an archaeological park visited by tourists from around the world. It is located in Southern Oman, which is the native growing zone for frankincense trees and source of the highly valued incense extracted from them. Al Baleed is a large walled ancient and medieval port city on the Indian Ocean from which frankincense, Arabian horses and other desert products were shipped out across the ancient world. Inhabited from the 6th through the 17th centuries AD, the site is impressive for its clear city plan with high building mounds, defensive city walls and towers, and stunning beachside location. It’s real value for us today lies in its evidence for urban life, flourishing trade, and multicultural interactions in the pre-modern period. Today we may be more aware than ever of how connected and interdependent we are with other people around the world, but few realize that this process began long ago. Al Baleed connects us to our shared human past, gives us a glimpse of how today’s globalized world developed, and reminds us that a peaceful beautiful Middle East exists beyond the media headlines. The large imposing mound now cleared of external debris is the citadel/husn and was the target of excavations between 1997-2007. Now slightly higher than 13 m., visible from the southern side are the semi-attached corner bastions and the southern gate in the center. The towers and gate belong to the latest phase of the city (1500 AD). The latter has a bent-axis configuration leading internally to a very large staircase. Internal excavations revealed a central courtyard surrounded by suites of rooms. Probably originally over four stories high, the building represents the home and ruling center of the Sultan. Clearly visible on the southern side, are massive blocks of the earliest city, ca. 950 AD. An earlier Iron Age settlement lies under the husn. Laura Whitehead and Vanessa Bunton operating the RTK-GPS at the site of Al Baleed in Oman. The remains of the Southwest Gate were first seen and described in 1979 but the entire plan was only uncovered in 2010. The original city wall approaches from the east, covered in places by later buildings. The gate itself, constructed by 950 AD, is similar to all other gates excavated along the seashore and consists of a massive foundation upon which three courses of the original gate can be seen. The external doorway threshold block is visible, probably set between two massive leaves of a formal door. A bent-axis approach leads to an inner doorway. This path connects the gate to the husn in the distance as well as a number of warehouses just inside the western city wall. The city wall running west is partially obscured by a later massive building, built by 1100 AD, which covers any extensions of the gate itself. In the latest phase (1400-1500 AD), a mosque was built over the earlier formal building. The city wall turns almost immediately south for some thirty m. to a large circular bastion/tower. For more information about the current excavations at Al Baleed click here. To see more of Bill Isenberger’s models here on Sketchfab, check out his profile!